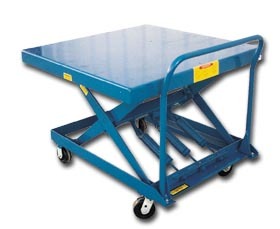 Raises or lowers as materials are removed or added to the platform keeping material at ergonomic work height. Utilize tension springs which can be adjusted in order to fit each particular application. Increases efficiency while reducing potentially harmful bending and twisting motions. Features springs with adjustable tension allow user to conveniently "fine tune" to fit the application. Removable handle is bolted on. Rugged heavy duty construction. Rolls on 5 x 2" polyurethane casters -- 2 rigid and 2 swivel with brake. FOB Shipping Point. Product No. Cap. (lbs.) Platform W x L Service Range Overall W x L x H Wt. (lbs.) Price Ea.